Winfred S. Hyatt Last Supper scene. For the first time in decades, Glencairn Museum is exhibiting three Easter scenes made in the 1920s for the Raymond and Mildred Pitcairn family. The scenes were designed by Winfred S. Hyatt, the principal stained-glass artist and designer for Bryn Athyn Cathedral and Glencairn. The following three events from the Easter story are portrayed: The Last Supper, the visit of the two Marys to the tomb on Easter Sunday, and the appearance of the resurrected Christ to seven of His disciples on the Sea of Galilee. Hyatt modeled the figures, which were then cast in plaster, painted and clothed. Before designing these, Hyatt had created three Christmas scenes for the family; both the Christmas and Easter scenes use the same decorated wooden display cases, made in Raymond Pitcairn’s Bryn Athyn Studios. The Easter scenes can be viewed at Glencairn on weekends from 1:00 until 4:30 pm thru March 26th, 2016 (March 20th is not available due to a concert). Visitors can also take an “Easter Art at Glencairn” guided tour at 3:00 pm on Saturdays and Sundays, or by appointment during the week. This tour, which begins with the Hyatt Easter scenes, includes key elements of the Easter story illustrated through medieval works of art in stained glass, sculpture and painting. Visitors will also learn how Easter was celebrated by the Pitcairn family when they lived at Glencairn. More information about the tour is here. Figure 1: Raymond Pitcairn smells a hyacinth, while one of his granddaughters looks on, circa early 1960s. The Winfred S. Hyatt Easter scenes were originally made in the 1920s for Cairnwood, Raymond’s childhood home, where the Pitcairn family resided until Glencairn was completed in 1939. The scenes continued to be displayed annually after the move to Glencairn, and soon became part of an Easter tradition enjoyed by the Pitcairn grandchildren. The grandchildren fondly remember coming to Glencairn to see the scenes with their parents each year, and picking out a flower to take to Bryn Athyn Cathedral on Easter Sunday (grown in the Pitcairns’ nursery). At Glencairn they also received a family Easter basket to take home. The Easter story is told in all four Gospels of the New Testament. The narrative involves tremendous sadness, followed by great joy. Some of the major episodes in the Easter story are 1) Christ’s celebration of a meal with His twelve disciples, known as the Last Supper, 2) His trial and then His crucifixion, known as Good Friday, 3) His resurrection on Easter Sunday, 4) and, finally, His ascension into heaven. 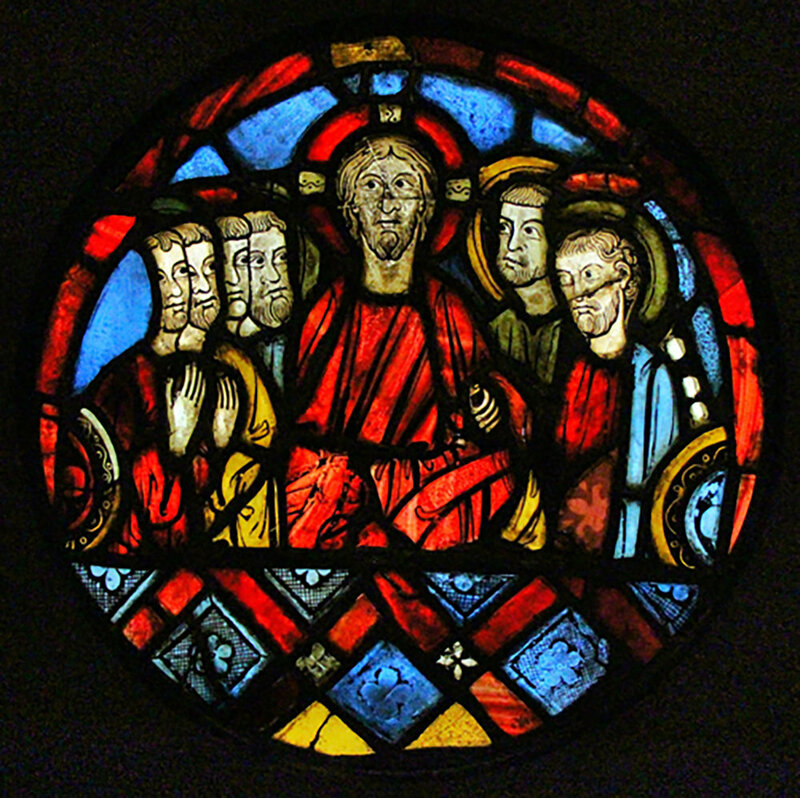 Figure 2: Thirteenth-century stained-glass panel from France, most likely depicting the Last Supper. Glencairn Museum, 03.SG.108. Figure 3: Detail from the Last Supper scene designed by Winfred Hyatt for the Pitcairn family in the 1920s. Figure 4: Fifteenth-century stone statue representing Jesus Christ during His appearance before Pontius Pilate. This style of statue is referred to as Ecce Homo ("behold the man"), taken from the New Testament Gospel of John (19:5). Glencairn Museum, 09.SP.86. Glencairn’s Medieval Gallery includes an impressive collection of stained-glass panels, several of which are featured on the “Easter Art in Glencairn” tour. One thirteenth-century panel from France depicts the Crucifixion (Figure 5). Christ on the cross is flanked by Mary, His mother, on the left, and John the Apostle on the right. John holds a book, while Mary reaches out her hands in an agonized gesture, as if she is trying to save her son. John rests his head in his hand, a convention used in medieval art to express grief. Personifications of the sun and the moon can be seen above the scene, emphasizing the Christian idea of the cosmic implications of the Crucifixion for all of creation. Figure 5: Thirteenth-century stained-glass panel from France depicting the Crucifixion. Glencairn Museum, 03.SG.221. Following Christ’s crucifixion, He was placed in a tomb provided by Joseph of Arimathea. Two of the Hyatt Easter scenes portray biblical events that occurred after His resurrection, when the tomb was empty. In one scene, taken from the account found in the Gospel of Matthew (28:1–8), Mary Magdalene and a woman referred to as “the other Mary” come to visit Christ’s tomb on Sunday morning (Figure 6). An earthquake occurs when an angel rolls back the stone blocking the entrance. The Roman guards are so afraid that they become “like dead men.” The two women are told by the angel not to be afraid, for Christ “has risen.” They are invited to see where His body had lain, and further instructed to go and tell the disciples the good news, and that Jesus will meet them at Galilee. Figure 6: Mary Magdalene and “the other Mary” come to visit Christ’s tomb on Sunday morning and are met by an angel. This scene is part of the Winfred Hyatt Easter scenes designed for the Pitcairn family in the 1920s. The final Hyatt scene is from the Gospel of John (21:9–14), when Jesus appeared after His resurrection to seven of the disciples by the Sea of Galilee (Figures 7 and 8). The disciples are out fishing, and do not catch anything all night. They are then told by a man on the shore to cast their net on the right side of the boat. Suddenly it is miraculously filled with fish, and they realize that the man is Jesus Christ. They come to shore, where a small fire is already waiting with fish and bread. Figure 7: Jesus appears to seven of His disciples by the Sea of Galilee following His resurrection. This is the final scene in the Winfred Hyatt Easter scenes designed for the Pitcairn family in the 1920s. Figure 8: Detail from the Winfred Hyatt Easter scenes of Jesus speaking to His disciples by the Sea of Galilee. The oldest example of medieval Easter art shown on the tour is a twelfth-century French capital (Figure 9). Raymond Pitcairn incorporated this sculpture into the design of Glencairn’s Great Hall, atop a column on the right side of the main fireplace. It depicts the moment of Christ’s ascension to heaven. Christ is shown in the center, His arms stretched upward. He is supported on either side by angels with halos in flight. Figure 9: Twelfth-century French stone capital depicting the Ascension in Glencairn’s Great Hall. Glencairn Museum, 09.SP.115. Figure 10: Sixteenth-century French stained-glass panel with the head of Christ. Glencairn Museum, 03.SG.9. The Winfred Hyatt Easter scenes can be viewed at Glencairn on weekends from 1:00 until 4:30 pm. The “Easter Art in Glencairn” tour is available on weekends, or by appointment during the week, until March 26th, 2016. For more information click here.